Paladin is available in several models. Paladin, Paladin Dual and the Paladin TG and two widths of 21”(533mm) and 24”(610mm). 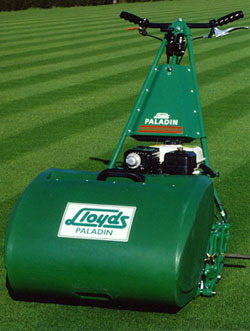 Lloyds Paladin self propelled Mower gives the finest cut to the finest turf on bowling greens, tennis courts, cricket squares, golf putting greens etc, Playablity is seriously affected by the finish demands the mowing excellent provided by the Paladin. Lloyds Paladin is available in 533mm(21") and 610mm(24") cutting widths with an option of 5, 9 or 11 bladed cutting cylinders. The Transmission is the heart of the Paladins performance, with independent clutches which have a unique system in preventing the machine from the snatching on take off, ensuring fine turf is not damaged. The Machine construction is of high-grade aluminium casting. Height adjustments is via a single adjuster with addiontal alignment compensation. It has a rotationally moulded grassbox with lifting handles for ease of use.